Although there are some audio formats that are so popular that they’ve become almost ubiquitous with music, there are many others that exist but aren’t used that frequently. As a result you may come across music in less popular formats that you can’t seem to play on some of your devices. Rather than trying to find an alternate version of a music track that you can’t play, it would be far easier to use Movavi Video Converter and convert it instead. In fact you can convert M4A to WAV, MP3, or any other formats that you need. Despite being a ‘video’ converter, Movavi Video Converter will let you easily convert audio files too. If you already have a music track that you’d like to convert, you should launch the software and click ‘Add Media’ then ‘Add Audio’ and select the track. Next, click on the ‘Audio’ tab in the lower section of the interface and select ‘WAV’, ‘MP3’ or any other category you want. 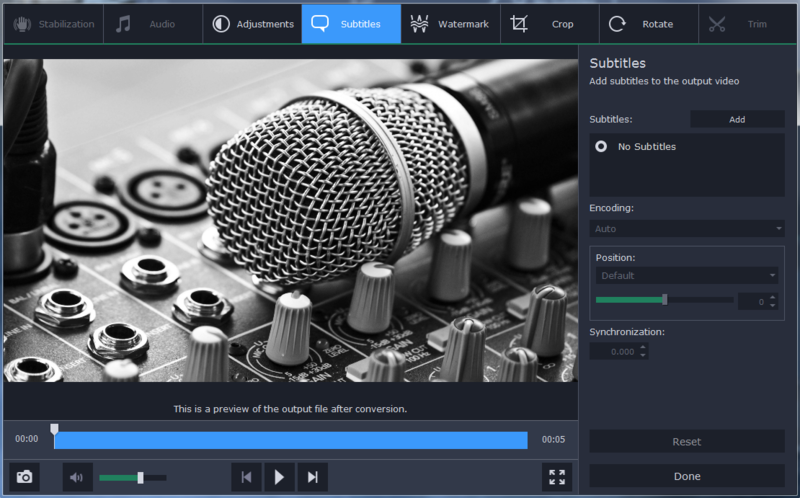 Under each category of audio formats, Movavi Video Converter will provide several presets that use different bitrates. The higher the bitrate the better the quality of the audio file, but at the same time its file size will be larger too. Rather than changing the bitrate, you could opt to use the original bitrate if you prefer. If you aren’t sure what the destination folder is set to, click on the ‘Folder’ icon next to the ‘Save to’ field to set the destination folder. After that just click ‘Convert’ and Movavi Video Converter will start to convert your music track to the format that you selected. It is worth noting that the steps to convert video files or images are pretty much the same as the ones described above, and so you can easily convert them to different formats too. More importantly the ‘Devices’ tab in Movavi Video Converter contains presets for different devise or platforms that you can use to automatically optimize the format and video settings if need be. Aside from being able to convert media files, Movavi Video Converter has numerous other features that may be useful. It will let you create animated GIFs from video clips, grab screenshots, extract audio tracks from videos, or edit videos by trimming out unwanted parts, cropping or rotating the frame, enhancing the video quality, and much more. At the end of the day you’ll find that there’s much more that you can do with Movavi Video Converter than just convert music, videos, or other media files. Its features coupled with the fact that it is so easy to use will make it a great tool to help you prepare your media files in many ways.